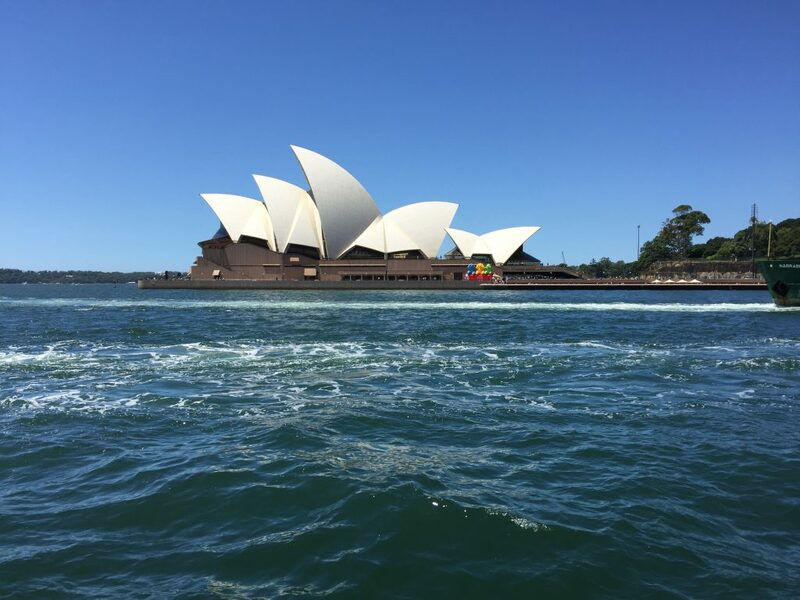 Sydney, Australia, starting and ending point of many cruises and a popular port of call on world cruises and other extended voyages, always makes the lists of the world’s most scenic harbors – along with the likes of Rio de Janeiro, Brazil and Hong Kong, China. 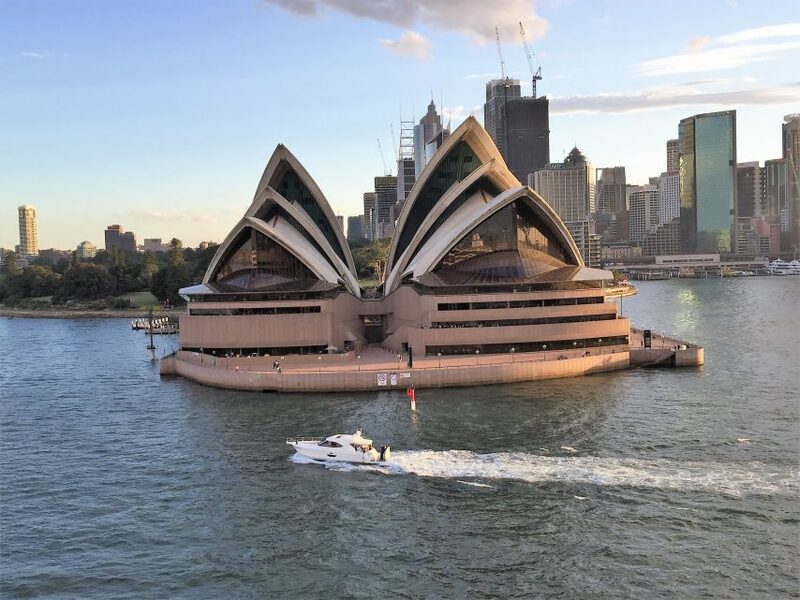 Without a doubt, one of the planet’s best natural harbors, Sydney Harbor –its official name is Port Jackson – has such world-famous sights as the Sydney Opera House and the Sydney Harbor Bridge. 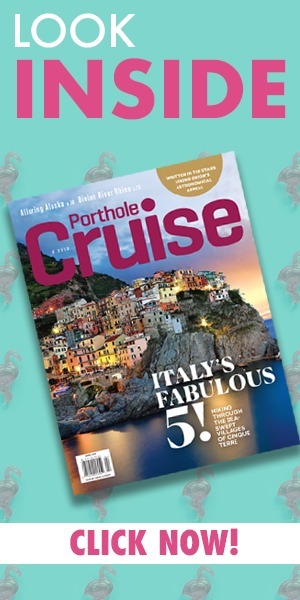 Most cruise ship passengers make it a point to be up on deck for their ship’s arrival – no matter how early it is – to take in its landscapes with modern skyscrapers and its seascapes with ferryboats and sailboats in the harbor. Our ship, Holland America’s Amsterdam currently on her annual World Cruise, made it easy to enjoy the early morning panoramas of our arrival by offering narration in the Crow’s Nest and serving juice, coffee and “Opera House” rolls (pastries to fortify those who skipped breakfast for the busy day of sightseeing ahead). 1) The Sydney Opera House with its white sail-like forms is arguably as much of an icon of Australia as a kangaroo. One of the 20th century’s most distinctive buildings, and a UNESCO World Heritage Site, the Opera House hosts some 2,500 events annually, according to Sydney Tourist Board materials. Designed by Danish architect Jorn Utzon, it has 10 roofs – the highest one reaching 221 feet above the sea – with tiles that gleam in the sun. It has various venues for concerts, opera, ballet, theater and more, and was completed in 1973 and opened by Queen Elizabeth II. Tours are available inside the Opera House including a backstage tour. Many ships offer evening excursions to catch a show at the Opera House so passengers can experience its excellent acoustics. 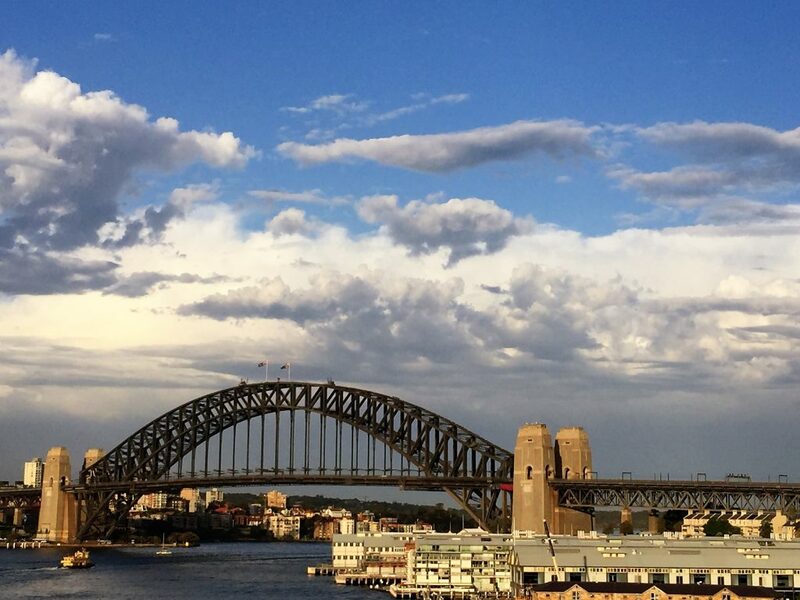 2) Another spectacular sight of the arrival in Sydney is the Sydney Harbor Bridge, opened in 1932 and reportedly the world’s widest long-span bridge and the highest steel arch bridge standing 429.6 feet above the harbor. Locals humorously call it “the coat hanger.” Visitors can walk across it, and the intrepid can sign up for a tour to climb it – there are hundreds of steps, and a breathalyzer test is required before climbing! Most cruise ships that visit Sydney offer this experience as a tour. 3) Taronga Park Zoo offers a chance to see and photograph kangaroos, koalas and other members of Australia’s fabulous fauna. The zoo boasts one of the country’s finest collections of animals and an Animals Encounters program whereby for a fee, visitors can enter some animal enclosures and have their photo taken by a professional. Other zoo highlights include an aquarium and a Great Southern Oceans Exhibit with Australian sea lions and fur seals, penguins and more. You can catch a ferry to Taronga Zoo from Circular Quay. 4) The Sydney Tower is the city’s tallest structure at 1,014 feet high – an iconic, sci-fi-like building since its opening in 1981. A Merlin Entertainments attraction (the folks that brought us, among others, the Orlando Eye and the London Eye) it offers panoramic views of Sydney and surrounding areas. 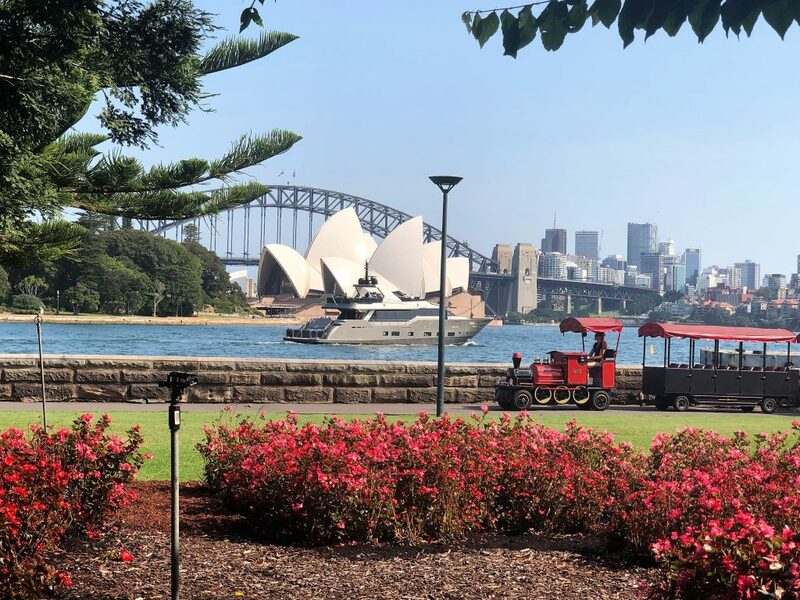 5) The Royal Botanical Garden is a lovely spot to visit with an abundance of local and exotic plants, guided tours, aboriginal experiences and more – a walkway on the southern side of Circular Quay leads to the garden (this walkway, by the way, also leads to the Sydney Opera House and a northern walkway leads to the Sydney Harbor Bridge). 6) Bondi, a suburb of Sydney, has a very popular beach particularly with surfers. The Big Bus hop-on/hop-off bus features a route to it. 7) Manly, one of Australia’s most popular seaside destinations seven miles from Sydney, is also great for a day at the beach. You can catch a ferry to Manly from Circular Quay. 8) The Rocks is the place of the foundation of Sydney and hence, it has great historic significance. It is a jumble of cobblestone streets and cul-de-sacs with cottages, sandstone terraces and old pubs, and the place where convicts from England settled in the 18th century. It also has museums and galleries and many lively cafes, shops and stalls selling souvenirs. 10) The Blue Mountains, so called because they are covered by a blue haze that makes them look that color, is a popular full-day excursion sold on most ships that takes participants to this wilderness mountainous area that is UNESCO World Heritage listed. Highlights include ancient rock formations and eucalyptus forests. 11) Local flavors are not to be missed, including lamb roasts with rosemary and garlic, beer battered fish and chips, and of course, barbecued shrimp – made famous by the phrase “slip a shrimp on the barbie” by Crocodile Dundee (actor Paul Hogan) in an Australian Tourism Board commercial. When it comes to souvenir shopping few visitors leave without purchasing boomerangs, didgeridoos (a musical instrument carved out of a tree branch and hand-decorated) and other aboriginal arts and crafts. Sydney shopping districts include Paddington (Oxford Street in particular), Surry Hills (Crown Street), Woollahra (Queen Street). If your ship calls at Sydney during a weekend, outdoor markets, including those of Paddington, are “musts” for avid shoppers.